Today we’re taking a look at Ron Berger’s An Ethic of Excellence. Berger is the Chief Program Officer for Expeditionary Learning, a national network of over 160 public project-based schools in 30 states. He writes An Ethic of Excellence, however, from a different seat – from his perspective as a public school teacher and carpenter in rural Massachusetts for 25 years. The central theme of Berger’s text is the idea that we need to shift from requiring students to complete a large amount of poor-quality work done quickly without revision to supporting students to create truly high quality work that is built through collaboration and revision and has value beyond school. To replace the industrial/factory model of schooling, Berger suggests an alternative: the concept of craftsmanship. To create this transition, we need a culture that supports students as craftsmen (and women). Though Berger offers several ideas for nurturing a culture that foster excellence, for today we’ll focus on one of the most distinct and powerful: critique. “We try to being with the author/designer of the work explain her ideas and goals and explaining what particular aspects of the work she is seeking help with. We critique the work, not the person. We try to begin our critique comments with something positive about the work and then move on to constructive criticism. We try to use I statements when possible: I’m confused by this rather than This makes no sense. The results of critique can be pretty amazing. 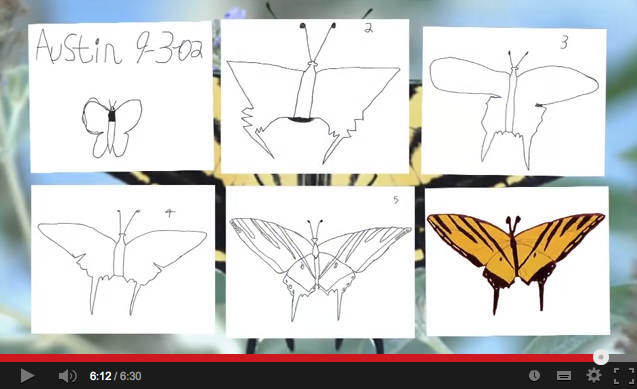 Take a look at this progression of drafts from a first-grader drawing a scientifically-realistic butterfly. Pretty amazing! Critique is a powerful tool in creating an ethic of excellence and getting students and teachers off the treadmill of work. Try it out in your class this fall and let us know what you and your students create!